PBR talks to us about how she got into roller derby. Special guest PBR from the SiouxCity RollerDames sits down to talk about the upcoming bout between the Sioux City Kornstalkers Vs The Cowtown Butchers coming up Saturday June 25 7 p.m. at the Golf Dome!!! From early childhood Marshall Greene has always excelled in sports. There was never a time when he was not involved in something athletic. “I am the kinda guy that will always strive to be the best at whatever I do, and no matter what, I will overcome any obstacle to reach my goal,” Greene said. It was not until high school that Greene discovered his true athletic potential. 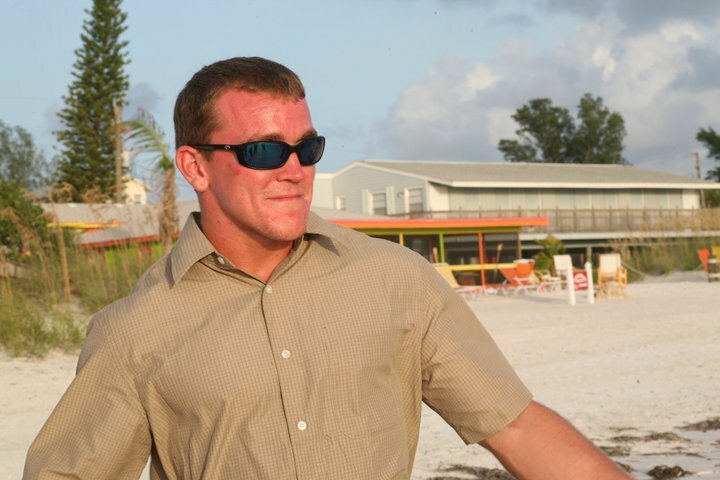 He was fully involved in the baseball and wrestling teams through his four years at Bayshore High School in Bradenton, Florida. Succeed he did, rising to become one of the best wrestlers in the school. He consistently placed well in tournaments and matches, earning him high ranks in the district and state levels. With Greene’s success in wrestling, full ride scholarships were real possibilities. It was during his senior year, however, that disaster struck. In a spur of the moment game of football, Greene was tackled hard injuring his right shoulder, which had already seen its fair share of injures throughout his high school career. What followed was surgery to repair torn tendons on his shoulder, thus ending a promising future in wrestling. “It was really devastating for me, just to be going into senior year and having this happen. I basically went from wrestling being my life and either competing or practicing every day to having a cast and sitting around my house,” Greene recalled. In time the shoulder healed and Greene was once again able to use his arm, yet it was never quite the same. With high school in the books, Greene worked at various different jobs, including continuing at the local pool and even becoming one of the wrestling coaches at his alma mater. There was still something missing though. Like sports Greene was striving for something more. Greene soon found that only having a high school diploma was an obstacle to a better job. Not being content with pick up jobs Greene tried out for lifeguarding on a larger plane… and he got it. Greene says, “I love this job. It is really demanding and hard work, but it pays off with the scenery.” The scenery is the blue green water and white sandy beaches of the Gulf of Mexico. 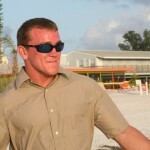 Greene is a certified fulltime Manatee County lifeguard on the west coast of Florida. The boy who loved to play sports has become the man who saves lives in the Gulf. Marshall Greene was born on September 28th, 1990 in Manatee Memorial Hospital in Bradenton, Florida. He is the son of Morgan Sr. and Ginny Greene, and is the middle child between his sister Michelle and brother Morgan Jr.
From early childhood Greene has always excelled in sports. There was never a time when he was not involved in something. It was not until high school that Greene discovered his true athletic potential. He began to become fully involved on the baseball and wrestling teams through his four years at Bayshore High School in Bradenton, Florida. While baseball was his true passion, it was wrestling that he truly excelled in. Succeed he did, rising to become of the best wrestlers in the school. He consistently placed well in tournaments and matches earning him high ranks in the district and state levels. Morgan Greene Sr. had this to say of his son’s accomplishments. With Greene’s success in wrestling it was foreseen as him receiving a full ride scholarship to numerous different colleges. It was during his senior however that disaster struck. During a backyard game of football, Greene was tackled hard and dropped on the ground injuring a shoulder that had already seen its fair share of injures throughout his high school career. What followed was surgery to repair torn tendons on his shoulder, thus ending a promising future in wrestling. Morgan Jr. saw how much this affected his younger brother, and noticed how depressed he became. Since Morgan Jr. is hearing impaired he used sign language with this wife Hidi who relayed this. With time still left in his senior year at Bayshore, and swimming season right around the corner, Greene decided to take a dip in the pool and joined the swim team. Greene did not go into the water dry however, having been a lifeguard at the neighborhood pool since freshman year. With this experience on his back, and a natural swiftness in the water, Greene received some success in the water and had an enjoyable time with the sport. Greene’s mom Ginny had this to add about watching her son. There was also a little swimming history in the Greene family. His sister Michelle had also been a swimmer at Bayshore High. After swimming ended, so ended the sporting career for Greene. He left a mark at Bayshore especially in wresting. With high school in the books, Greene went on to work at various different jobs, while also continuing to work as a lifeguard. When wresting season resumed at Bayshore, Greene took on the role as one the coaches for the wrestling team. Greene eventually stopped working at the pool and got a job as a county lifeguard at the public beach in Bradenton where he continues to work today. Ron Rea owner of Tobacco World stores in Western Pennsylvania sold himself a winning $1.8 million dollar winning lottery ticket. Rea, who owns stores in Uniontown and Belle Veron, says that he usually spends around 20 dollars a day on the lottery. Rea said that the money will be a big help to himself and his wife in building their retirement fund. Whenever I read stories of people winning the lottery, they never look like this. The story never involves the seller of the ticket winning. This was a nice article to read. Rea seems like a nice guy who struck some luck and now the money will benefit him and his wife. I would not have changed how the article was written. I feel that it was put together well and flows nicely. There is nothing that I would change with the article. All the main parts are covered, anything else added would just be extra.